Looking For The Best App Maker? We spend our days using, and reviewing, app makers just so we can share our findings with people like you. The grid below is a summary of the best ones we’ve looked at so far, but click through to read our reviews for a much more in-depth look at each. And I’m the one who spends my days on app makers, testing and writing and drinking coffee. All so that you can make the right decision. Note: Please note the prices here are per month based on a yearly payment. We try to keep prices current, but there may be some differences. Read more about how pricing works here. Helps you create an native app for your business "in 5 minutes". Works with WordPress and WooCommerce. A fast-growing app maker based in San Diego, California, BuildFire offers tons of features for your first app. GameSalad offers an intuitive drag and drop interface that focuses on the creation of mobile games for Android and iOS. With templates for school apps to m-commerces, iBuildApp claims to offer everything you need for your first app. MobAppCreator is a self-proclaimed "online service that provides the tools to create native mobile apps simplified". AppsBuilder offers "the power to design a professional app at your fingertips". 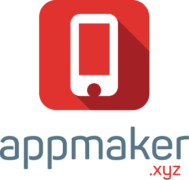 Why Choose an App Maker? While it’s even easier these days to create your own mobile app, there are still some positives and negatives of this format, and with the builders themselves. Maybe you’re wondering whether the costs outweigh the benefits in going mobile? Well let’s have a look at the good and the bad points of mobile app makers, in comparison to getting them created professionally. When you compare the costs associated with using an online builder, as opposed to using a professional programmer (or team), there really is no comparison. Even with the best app maker you’ll only be spending, perhaps, $700 a year, while using professionals can cost a five figure amount just in the creation phase! Another cost advantage is that most builders offer monthly payment options, which means you’re not locked in, and you can also try them out for free to begin with. Another difference is that you can create your own online app much faster than it would take to build one professionally. Instead of months, you could have your app in an online store within weeks or even days. Being at the mercy of a programmer can sometimes get complicated when you don’t have the specific knowledge to communicate easily. With an app builder it’s you who is in charge of the project from day 1. Most app makers allow you to create a native app for more than one platform, for example iOS and Android, all in one go. A programmer would charge you separately for each operating system, increasing both the time taken and costs associated with your project. Updating your app can be a pain as things, such as incompatibilities between OS’s, may arise. 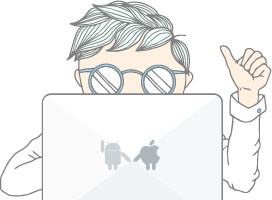 App makers can ease this burden as they take care of most issues regarding feature compatibility for OS’s and phone models as new options become available. They also often have support channels to help with specific issues if needed, and all these things come at no extra cost. While most app makers do have a range of great features, there are still some things that are just too complicated to do without creating specific coding and having a knowledgeable programmer handy. This also applies to the design of your app. If you really want to create a truly unique looking app, you may hit roadblocks with online app builders due to template and design restrictions. Similar to the above, if you really want to create a large, involved app, then it’s most likely not possible to do with an app maker due to restrictions in flexibility and features. For example, most app makers don’t allow in-app purchasing due to technical requirements from the Apple store. While there are manual ways around this, it would require a lot of time and effort for each paying customer. It’s important that the app builder you go for is well-managed from a business point of view, because you could lose your app if it all goes south. For that reason, we’d recommend you go with an established provider. If your project requires multilingual content, then you may have a tough time creating an app that caters for this through app builders. From what we’ve seen, none of them have an elegant solution for this just yet. You can only select up to five app makers.